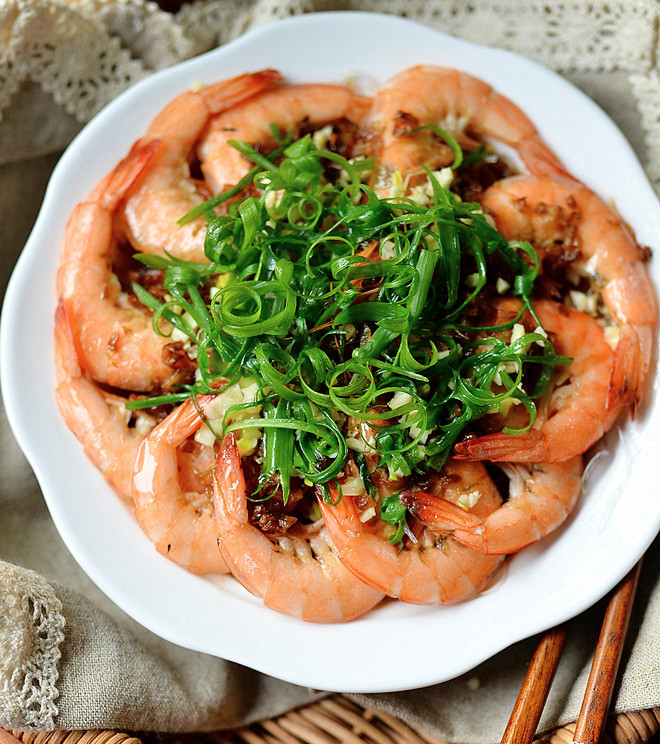 Chinese New Year dishes are usually time-consuming; however, you do have delicious and fast alternatives to please all your guests. 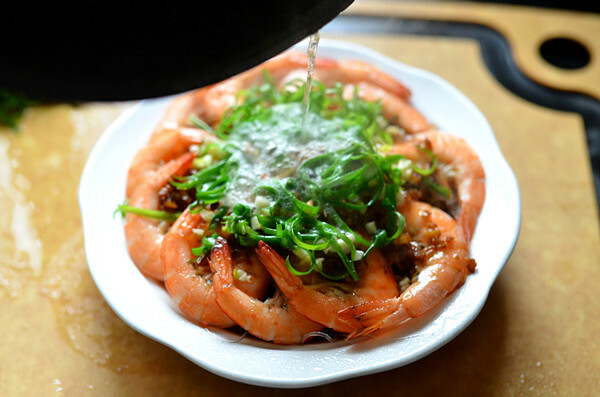 Shrimp with garlic sauce is a traditional dish in Guangdong Province, China. It is definitely a model of color and flavor. It takes as little as ten minutes, but it will definitely add a lot to your table. 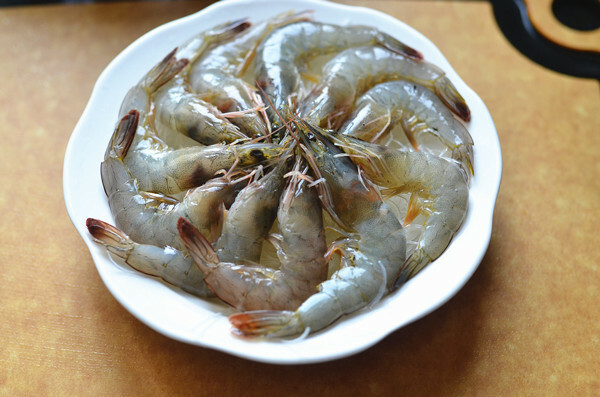 Today I use two methods to make Chinese shrimp with garlic sauce, one is steamed and the other is baked. Each method has its own characteristics and flavors. The first method(steamed) is my personal favorite. “Steaming” is a seemingly simple cooking method: no fumes, less greasy, simple and fast, so that we hold onto the original flavor after steaming the dishes. The garlic sauce also really stands out in this version. Step 1: Cellophane noodles are soaked in advanced in warm water. Step 2: Use a toothpick to clean out the back of the body of the shrimp. Wash the shrimp and pat dry. 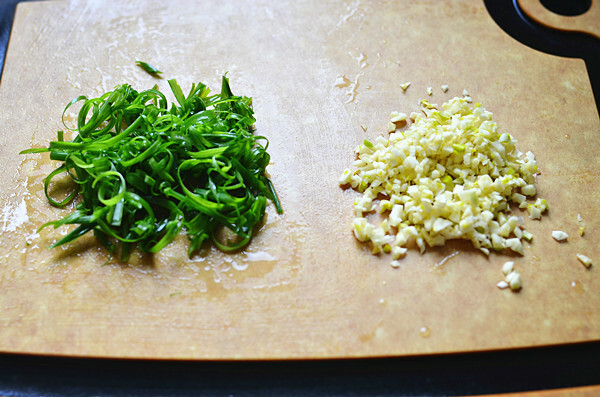 Step 3: Prepare and cut the garlic and green onions. 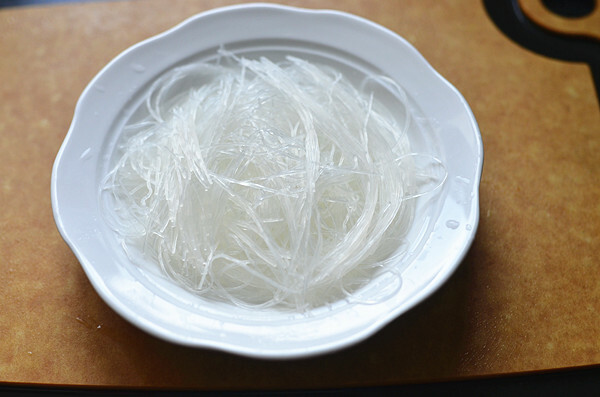 Step 4: The soaked Cellophane noodles are drained and cut to be shorter. Lay them on the bottom of the plate. 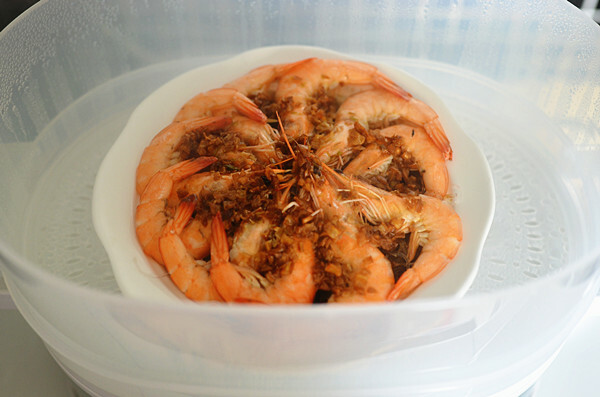 Step 5: The shrimps are neatly placed on the Cellophane noodles. 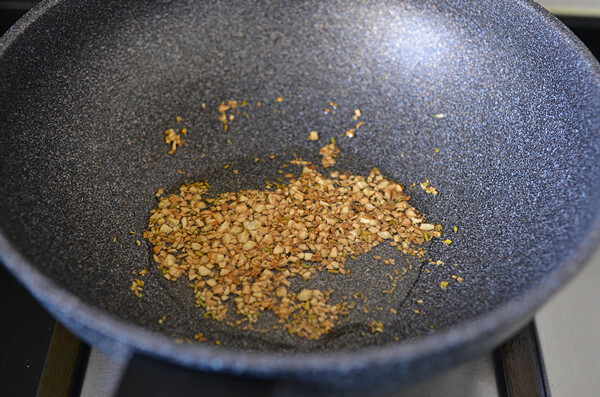 Step 6: In a pot over low heat, add some peanut oil and half of the garlic and cook until golden brown. 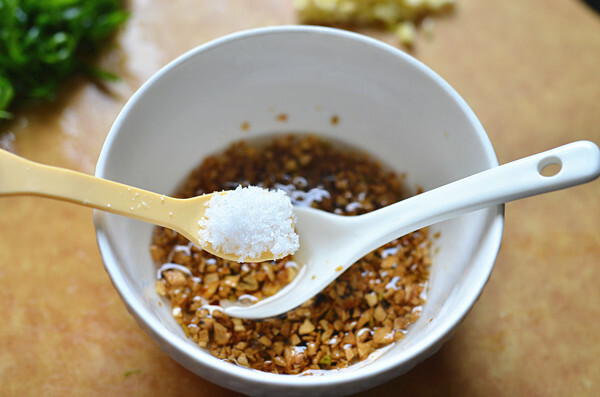 Step 7: Pour the garlic oil into a bowl and add 2 tablespoons of light soy sauce. Step 8: Add a teaspoon of fine sugar and mix well to form the sauce. Step 9: Pour the sauce on the shrimp. Step 10: Put in a steamer and steam for 10 minutes. Step 11: Remove and sprinkle with the remaining garlic and the green onion. Drizzle a spoonful of peanut oil from the pan you used to cook the first half of garlic over the top and it’s ready to enjoy! 1. 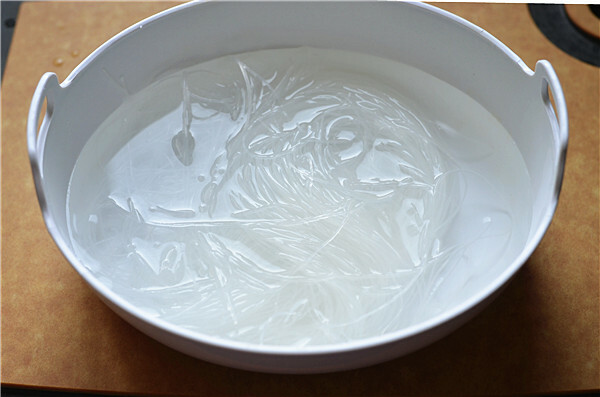 Cellophane noodles are soaked in warm water to make them softer in advance, and cut them shorter so they are easier to eat. 2. 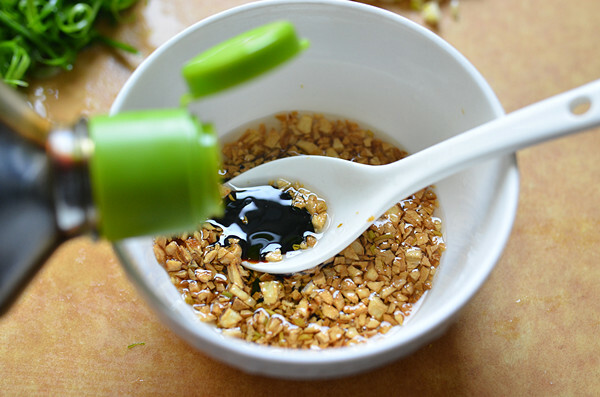 The last spoonful of hot oil is essential, it will instantly ignite the flavors and aromas of the green onion and garlic. 3. After the sauce is cooked, you can taste it. If you like, you may add a little salt to taste. 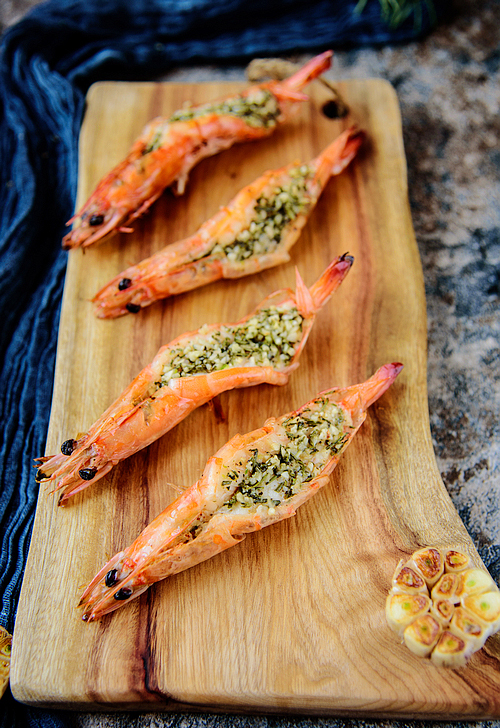 This grilled shrimp is also great looking and delicious. 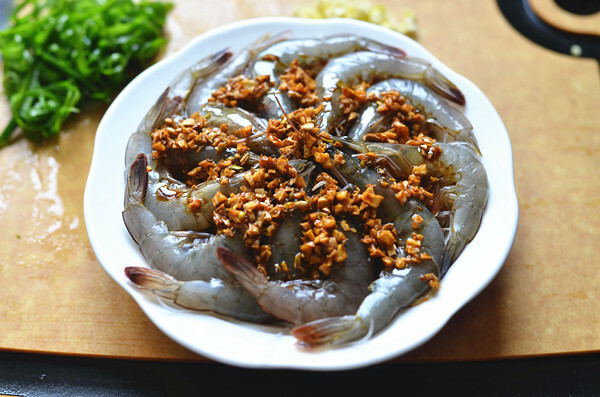 As a banquet dish, it can be said to be one of the preferred dishes. 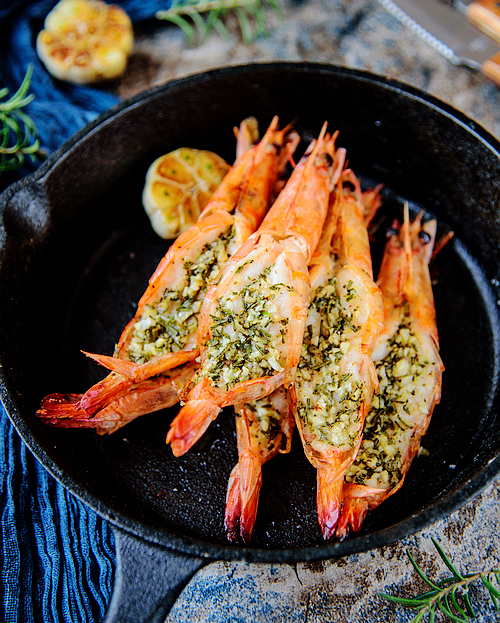 The most important thing is that the baked shrimp is tender and juicy, with a butter and garlic sauce. It can be said that it does not need too much seasoning, it is already very delicious! Step 2. Prepare the shrimp. 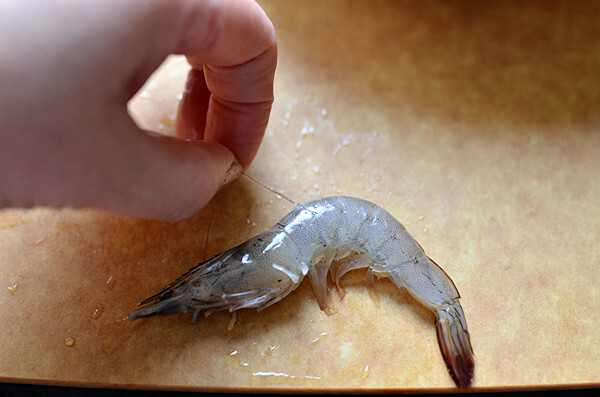 Cut down the shrimp’s back, and remove the vein. Step 3. 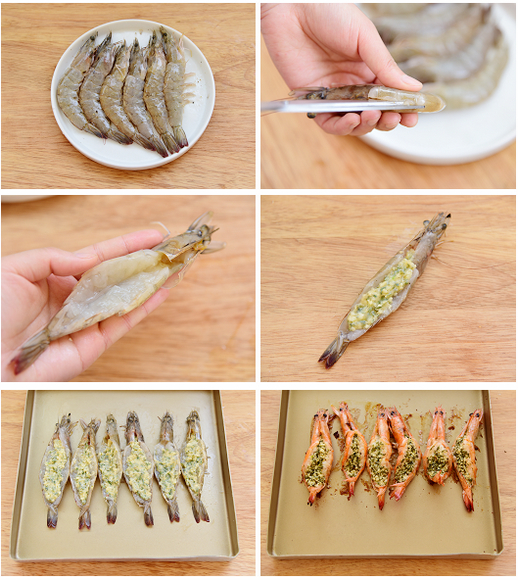 Open the back of the shrimp. Step 4. Sprinkle with salt and black pepper, and drizzle cooking wine over them. Let sit for 1 hour. Step 5. Spread the butter and garlic sauce evenly on the shrimp. Step 6. Placed on a baking tray. With the oven preheated 210 degrees, on the middle rack, bake for 12 minutes. Step 1. Prepare the ingredients and chop up the rosemary and garlic in advance. Step 2. The butter is heated and melted in a microwave oven. Add the rosemary, garlic, sea salt and black pepper and mix well.